Tag line: "She's the target of every eye... including eyes only science could create"
Though he surely didn’t know it at the time, director Bertrand Tavernier's Death Watch provided audiences with a glimpse into the future of television. This fictitious tale, about a dying woman hounded by TV networks wanting to make a series out of her final days, had all the makings of a fascinating sci-fi story in 1980. Were it produced today, with reality television as prevalent as it is, Death Watch would have almost certainly been a documentary. Set in a future where illness has been nearly eradicated, romance writer Katherine Mortenhoe (Romy Schnieder) has somehow contracted a rare disease, and is dying. Though devastated by the news, Katherine also becomes an instant celebrity, with various media outlets vying for the opportunity to broadcast her death. One television network in particular, NTV, which is headed up by executive Vincent Ferriman (Harry Dean Stanton), offers Katherine a huge sum of money for the exclusive rights to her last hours on earth. At first, Katherine agrees to sell her “story”, but then changes her mind and goes into hiding, determined to spend the little time she has left in seclusion. Soon after, she meets Roddy (Harvey Keitel), and the two become fast friends. What Katherine doesn’t know – and the rest of the world does – is that Roddy’s actually an employee of NTV. What’s more, he recently underwent an experimental procedure to implant a camera behind his eyes, allowing him to record images of Katherine on the sly, which are then transmitted to the network. But what begins as an assignment soon gets much more complicated when Roddy finds himself falling in love with Katherine. As Roddy struggles with his conscience, Katherine discovers a shocking secret about the true nature of her illness, one that threatens to tear both their worlds apart. Death Watch is not a high-tempo movie; on the contrary, it plays out at a leisurely pace, giving director Tavernier enough time to toss in some beautiful imagery. Roddy, unable to sleep because of his implants (any prolonged period of darkness will cause the camera in his head to switch off, thus leaving him blind), spends his nights walking through Glasgow (where the film was made), leading to some breathtaking shots of the city. Along with its pacing, Death Watch is an unusual sci-fi entry in that its scientific aspects often take a back seat to the “human factor”. When Roddy pays a visit to his ex-wife, Tracey (Therese Liotard), the two attempt to rekindle the passion they once shared. Yet just before they’re about to make love, Roddy pulls away. Never quite sure when his implants are transmitting images, he’s unwilling to “put on a show” of that nature for his pals at NTV (who were, indeed, watching). Despite the fact he’s part of a system that thrives on public exhibition, even Roddy seems to agree some things are better left in private. Movies like Death Watch and Peter Weir’s The Truman Show predicted a future where mankind, in an effort to better understand the human condition, turned their television cameras back on themselves. What the viewing public got, however, wasn’t "reality" at all, but an artificially concocted version of it, created by networks that exploited and manipulated people, all in an attempt to boost ratings. 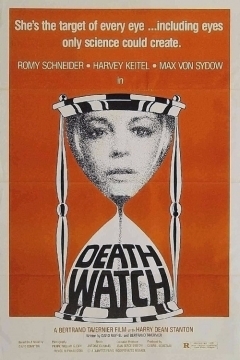 As effective a sci-fi morality tale as Death Watch is, it also served as a chilling portend of things to come.